You may not have heard of a company called Taboola, but what it does may annoy you greatly. "Controversial slimming pill sweeps the UK", "15 inconveniences of being a woman", "Nine people you won't actually believe exist", "Danger! Don't watch this with your wife" - if you've ever seen any of these headlines screaming out at you, then you'll be familiar with the company's work. 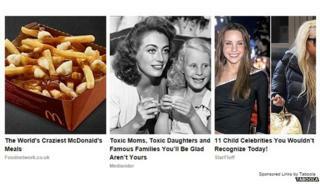 Taboola is one of the main providers of sponsored stories on news and gossip websites. When you scroll to the bottom of the page, there are picture and caption links to three, six or eight external stories, typically under the headings "More stories from around the web" or "You may like". More often than not the captions hoping to tempt you to click on them are just a little lowbrow, and the photos accompanying them typically show celebrities or women in bikinis (or both). Critics have described Taboola's (and its rivals') content as "spam", "click-bait", "degrading", "representing a race to the bottom" and many other derogatory terms. Yet 400 million of us around the world click on Taboola's links every month, and the business - which was only founded in 2007 - now enjoys revenues of $250m (£154m) a year. Taboola, which is essentially a hi-tech digital advertising company, was established in Israel by Adam Singolda, who had previously spent almost seven years as an officer in an elite encryption unit of the Israeli Defence Forces (IDF). While the technology the company uses is sophisticated, Taboola's business model is straightforward. News websites don't have to pay to carry its links, and instead they get a share of the advertising revenue that Taboola receives from the advertiser behind each promoted story. For many newspaper groups who are continuing to see sales of physical newspapers plummet, Taboola provides them with a much appreciated new digital revenue stream, helping them to better monetise their websites. Yet why is Taboola's content often so annoying? A charming Mr Singolda, 32, who is the company's chief executive, jokes that we only have ourselves to blame. "The problem is that for everyone who hates one piece of content, many others love it, and click on it," he says. "So we register it as a popular story, and leave it up, so more people can see it. If no-one clicked on it, or tweeted about it, then we would remove it." He adds: "A journalist once complained that he was always seeing stories about [reality TV star] Kim Kardashian on Taboola. So I asked him if he ever clicked on them, and he said yes. So I replied, 'What are you calling me for then?'" Yet Taboola does seem to have taken the criticism on board, as a year ago it introduced a tool to enable people simply to click to remove stories they don't like. And as long as a reader of a particular news website doesn't remove the cookies that recognise who they are, Taboola's software will remember their preferences. So if someone clicks once to remove a link to a story on Kim Kardashian, that should be the last time they ever see her via Taboola. And Mr Singolda insists that the company's software is getting ever more sophisticated in how it aims to provide people with the additional content they may want. So to use one simple example, if someone often reads stories about wine, Taboola will aim to provide wine-related sponsored story links. While Mr Singolda came up with the idea for Taboola after he left the army, he says his military service played a vital role, as it gave him a wealth of training and managerial experience. A keen computer programmer, and maths whizz kid since he was a young child, upon starting his compulsory national service, he was chosen for the IDF's computer science training programme, before graduating first in his officers' training class. At the age of just 20, he was leading a team of soldiers doing encryption work, such as allowing an Israeli general to use his mobile phone securely. "There was no money in the world you could pay to get that experience," he says. "I learned firsthand how to lead a team, and get everyone to work together. And being the army I couldn't give anyone any financial reward - the only way to get people to do stuff was to inspire them." The army also enabled Mr Singolda to meet and get to know many people who would go on to join him at Taboola. After leaving the army, he came up with the idea for Taboola while living back at home with his parents. He managed to secure the backing of an angel investor, and with a handful of staff and no turnover for four years, developed the software before Taboola was eventually launched to customers. Today it has 200 employees, and the news websites that use it include USA Today and the Huffington Post. While Taboola's headquarters is now in New York, it maintains a large office in Tel Aviv, and is just one of a great many hi-tech firms based in Israel. Mr Singolda says Israel is so strong in the technology field for a number of reasons, including the training that military service provides, and the fact the country has always had an entrepreneurial culture. And while some Taboola employees are IDF reservists who were called up to serve during the recent conflict in Gaza, Mr Singolda says the company was otherwise unaffected. Instead, Taboola is now looking to secure a fresh multi-million dollar injection of investment, as it plans to expand around the world - both with and without Kim Kardashian.